The Trowley Farmhouse is situated on our 400 acre family run sheep and beef cattle farm. We lamb from March to May, and calve during the summer. Our animals enjoy running free outside for most of the year, with the sheep having a summer holiday up on the common each year. The farmhouse is situated away from the working part of the farm, with a private road and yard for parking which farm vehicles do not access. 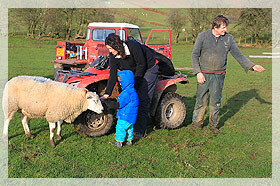 However, we recognise the intrigue that farms hold not only for child visitors but also adults, and so we offer a ‘farm experience’ of an hour or so where you can come and feed the animals and ask questions about life as a Welsh hill farmer. The animal feeding varies throughout the season; in Spring come and bottle feed lambs, Summer come and feed the bucket calves, Autumn and it’s all about buckets of cake for the cattle, and in Winter there are over 1000 greedy sheep to feed. We are excited to welcome our new weaner piglets each year, and with 4 working sheep and cattle dogs and chickens too there is always something to see. Visitors to the farm do so at their own risk. Hand sanitizer gel is available for after visiting the animals, and the experience is free of charge.